By Kay Tan in Mobile. Updated on August 29, 2017 . 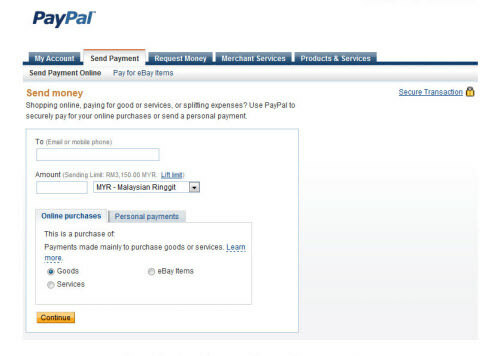 If you make funds transfer or payment via Internet, you should be familiar with the name PayPal. PayPal is one of the safest and most convenient ways to perform monetary transaction online. But that being said, there are still a lot of users who have problems and questions using PayPal on a daily basis. It is important to understand how PayPal works; a person who knows how the service works will get their transactions done quickly and safely, but if you don’t, you may end up losing unnecessary transaction fees or facing unforeseen difficulties that requires the attention of PayPal Support. If you have trouble understanding some issues about PayPal, we hope this will help you clear some clouds. 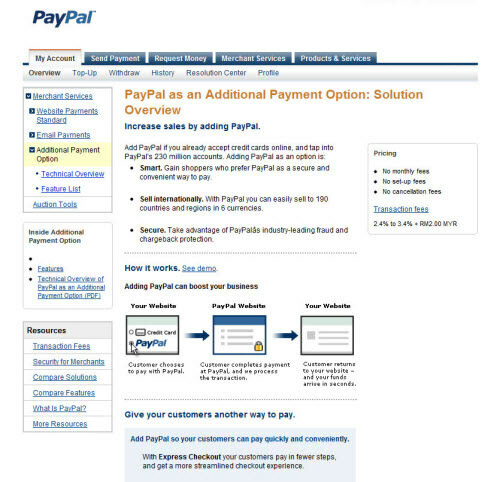 Here’s 10 most asked questions about PayPal together with solutions and some useful links. Receive credit card payments; Is it free? 1. What PayPal account type should I get? In a nutshell, there are three main types of PayPal accounts: Personal, Premier, Business. But there’s also a Student account, which can be created under either one of the above mentioned 3 account types. No transaction fees for payments through eChecks, Instant Transfer, PayPal balance. E-commerce sellers with higher transaction volume/ need to accept credit card payments. Suitable for business owner(s). Higher transaction fees when receiving money from credit/debit cards. Transaction fees when receiving payments. Transaction fees when receiving payments. Limited support to PayPal merchant services. Unlimited credit card payments. Unlimited credit card payments. Lower fees involved if receive money from credit/debit cards. Lower fees involved if receive money from credit/debit cards. Full support to PayPal merchant services. Full support to PayPal merchant services. PayPal debit card available. PayPal debit card available. On top of Personal, Premier and Business account. PayPal also allows one to open a student-type account. It can be opened by the parents for their teen, or can be apply by the teen themselves as long as they are 13 years old and above. Learn more about PayPal Student Account. 2. Online Purchases vs. Personal Payments – What are the differences? From PayPal’s perspective, payments (money) can be send in two ways. You can either send them as Online purchases, or Personal Payments and transaction fee may be applied. It’s free to send/receive money as long as they are from your PayPal balance/bank account. It’s free to make payment from PayPal account for the purchase of goods/service. Transaction fee of 2.9% + $0.30 when money comes from credit card. Transaction fee of 1.9% to 2.9% + $0.30 will be charged on the receiver’s end. Sender gets to decide who bears the transaction fee. Receiver can apply for lower merchant rate fee. On top of these, if the transaction requires currency exchange, additional fees will also be applied. Learn more about PayPal domestic payments vs. International payments. 3. How to use a credit card with PayPal? 4. How to withdraw to credit card and/Or bank account? PayPal has various ways for you to pay and get paid depending on your country. For some countries you may add a local bank and have money withdraw to your bank account; for some you can only withdraw to a U.S bank account or request for check payments. Be sure to check with this list first before attempting any withdrawal. Go to "My Account" > "Withdraw". Click "Withdraw funds to your bank account". Enter your bank information and click "Continue". It will take 5 – 7 days to transfer the fund to your bank account. 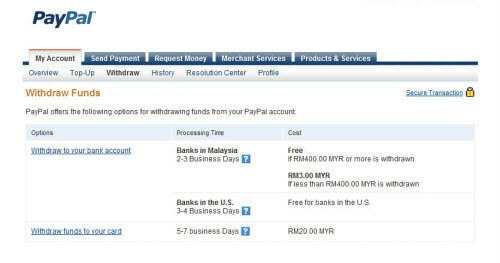 PayPal personal account members are restricted to withdraw more than $500.00 per month. Go to "My Account" – "Withdraw". Click "Withdraw funds to your bank card". Enter the amount and select a credit card to receive payment. This transaction will normally take 5-7 days. However the length of time might be affected by card issuer’s policies. Withdrawals to your card must meet a minimum withdrawal amount. 5. 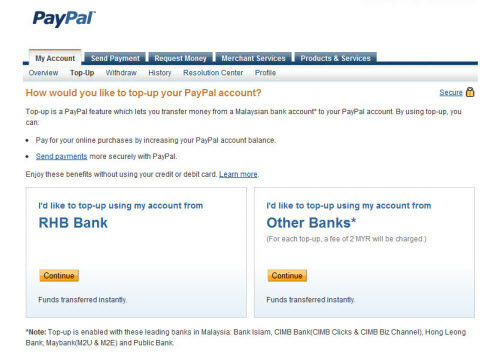 How to top-up PayPal account? It is easy to top-up your PayPal account – adding more funds to increase your spending limit. Topping up your PayPal account is free but charges may apply by your local bank. Go to "My Account" > "Top Up". Select your bank and click "Continue". You’ll be redirected to a page to fill in your top-up amount. If you want to top-up US dollar, fill in the exact amount and click on "Recalculate" to update/refresh the total in your country currency. It may take up to 1-3 days, depending on your bank, to receive the top-up payment in your PayPal account. You are not allowed to top-up for others; bank account and PayPal account must share the same person’s name in order to perform a top-up. 6. 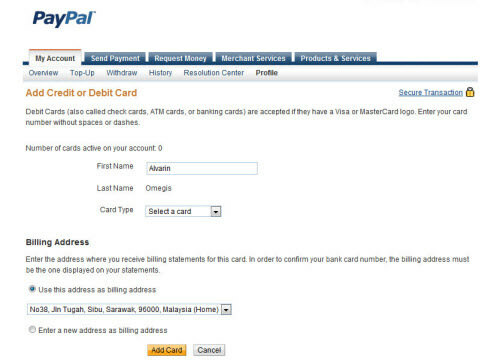 How to receive credit/debit card payments via PayPal? Is it free? Buy now, allowing client/customer to pay you instantly. Select multiple items, add to cart, and check out later. Subscribe and send payments in recurring (every day, week or month) mode. 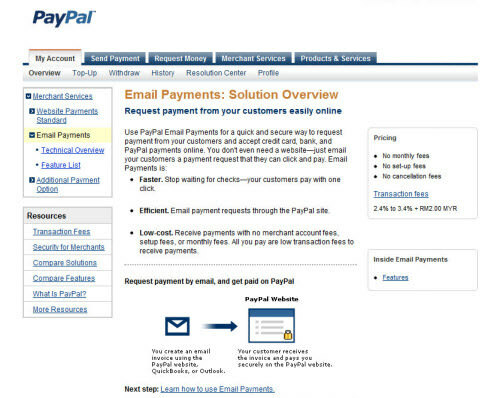 PayPal Email Payments allows you to request payment from your customers via email. It’s a secure and quick way to accept PayPal payments online, bank payment or credit card payment. Your customers can easily make the payment with one click. A low transaction fees will be charged to receive payment through PayPal Email Payments. Make sure you check out the complete features of PayPal Email Payments too. By adding PayPal as an Additional Payment Option on your website, you provide client/customer an option to pay via PayPal right from your website. This is an easy and convenient method to ask for payments. Bear in mind that higher fees will be charged for Personal PayPal account to receive payment from a debit card or credit card. If you have business/premier account, you can receive credit card payments from buyers even they’re not PayPal users. No PayPal account registration is required for payees. 7. 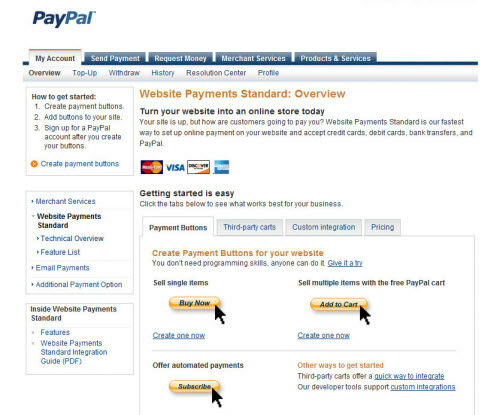 How to create a PayPal payment button? This is one of the method discussed in the above "How to receive credit/debit card payments via PayPal?" but I’ve decided to go break it down and go into more details as this is one of the most asked question about PayPal. Go to "Merchant Services", select "Website Payments Standards" on your left. Select one of the 3 button (mode) how you like payments to be made. Eg. Buy Now, Add to Cart or Subscribe. Choose a button type and enter your payment details. Fill in optional information for item name, item ID, price, currency and customize advanced features. Complete the process by clicking "Create Button" at the bottom of page. Note: You can either click "Select Code" to select all the button code then copy the code and paste in your website or send the payment link via email. 8. Is PayPal currency exchange rate same with local banks? PayPal’s currency exchange rate is always higher than market and bank rates. It is out of the way how PayPal profit from services they provide. Go to "My Account" > "Profile". On left of the page, click "My Money". Click "Currencies" next to PayPal balance. Select a currency if you have more than one currency in your PayPal account. Enter the exact amount, the exchange currencies and click "Calculate". The exchange rate will be display with the total amount and PayPal exchange rate. 9. How to turn PayPal into an online credit card swipe machines? PayPal Virtual Terminal is an online credit card swipe machines; in short it allows you to turn your computer into a credit card terminal, enter orders and start charging your customers. You’ll be provided with a card swiper (USB) to plug directly into your computer upon successful application of the service. This feature is only available for Premier and Business type accounts. 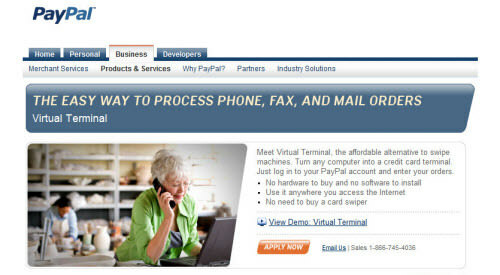 With PayPal Virtual Terminal, you can take an order by mail, fax or phone. Just log in to your PayPal account and enter the given credit card info. It works anywhere as long as you have Internet access. Majority of credit cards are accepted, and the payment reaches your account on the fly. 10. 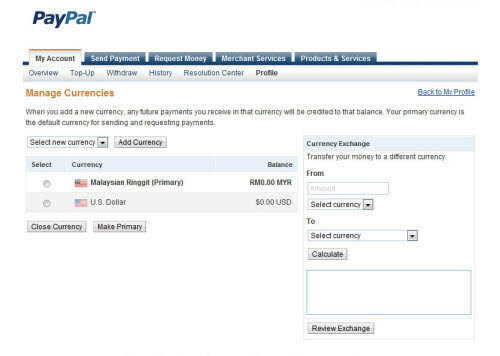 How to add new currencies in my PayPal account? Click on "Profile", then "My Money" on the left of the page. After that, click "Currencies" next to your PayPal balance. At "Manage Currencies" section, you can add a new currency, and any future payment you receive in that currency will be credited to that balance. Your primary currency is the default currency for sending and requesting payment.